Dreams and reality are often conflated, that is the essence of magical realism. Emma Allman describes it succinctly – Magical realism can feel more nebulous than your average genre. The very name sounds pretty darn contradictory. If there’s magic involved, isn’t it fantasy? How can it be realism if there are magical elements? What is magical realism? The definition has come to encompass a few different functions of fantastic elements in stories that are unwilling to confirm or deny for the reader that these elements exist in its world. It can sometimes feel unsettling or give the story a dream like quality. 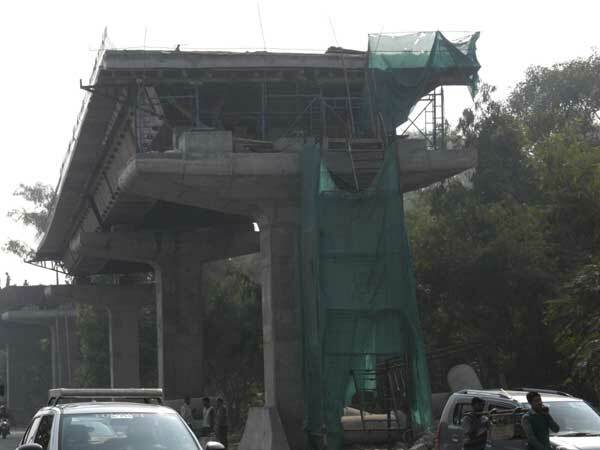 But in a nation of the blind, the shill of influencers matters as we have seen in the case of the ugly architectural disaster called the RTR (Rao Tula Ram) flyover, a walking, talking apogee of how not to undertake an infrastructure project. The lifeline to the National Capital's airport terminus under construction for years on the Ring Road. The construct of this abomination remains vexed, dogged as it is by time and cost overruns. A hideous illusion in a hall of mirrors. Unfortunately one has to view it from close quarters every working day, as one sits manacled in the car as tailbacks due to the incomplete nature of the project make you wait in anger and pain. Handcuffed by a group of powerful vested interests living in the immediate vicinity of this controversial flyover and backed by a top government official, also a resident of the once tony Vasant Vihar, the project has been delayed interminably and no one has a clue as to how fix what is clearly broken. In November 2014, the project for the parallel flyover on RTR Marg was floated with a budget of ₹278 crore and was scheduled to be completed in 2016. However, 47 months later, 56 per cent of the work is incomplete. Which means if a millipede was to race with a centipede, one would get an average construction speed of less than 1 per cent per month. Public Works Department (PWD) officials bemoan the fact that delays were triggered by late permission for cutting of trees, shifting of utilities, residents’ opposition and financial problems with the construction company. Yes, you guessed it right, a financially troubled company called Hindustan Construction Company (HCC) is involved in building this catastrophe. To trace the genesis, in 2009, a single-carriageway flyover was constructed here after enormous pressure was exerted by a group of house owners in complicity with a top rung governmment official, which instead of clearing traffic, created bottlenecks. Since then, multiple solutions have been tried, the final one being a “parallel flyover” to ease the traffic. Meanwhile the single carriageway flyover has become a dual carriage way and sometimes owing to the pressure on it, actually wobbles. Delhi’s PWD wants to meet its December 2018 deadline to complete the 2.7 km-long three-lane flyover that will run parallel to the existing Rao Tula Ram (RTR) Bridge connecting south Delhi with the airport. This road has been perennially choked and unending construction work is making things worse. Over the weekend, I decided to take a recce around what appears to be a bombed out Aleppo, a series of strange inverted U-shaped pillars mark the area with some sort of gigantic steel trays set on top of some of them. Maybe a close encounters of the third kind is expected and these giant receptors will see Martian landings. Realistically, they could see prefab cement blocks being inserted to connect what resembles a bizarre pathway. While the inverted U-shaped pillars appear ready to receive the cement from the Gods above, beyond some of the trays, there is no movement which signifies impending closure of any sort. This construction activity has turned the stretch — from Munirka Flyover to Vasant Vihar, RTR and Palam Road— into a traffic nightmare, as airport-bound commuters have to wade through heavy traffic. Since RTR sits slap bang on the Ring Road, it forms only one part of this travesty, the other being the Dhaula Kuan corridor which is the alternate route to Sardar Patel Marg and the key approach road to Lutyens Delhi. After getting stuck in a monster logjam in December 2015, transport minister Nitin Gadkari had taken up the task of making the stretch signal free, but it took more than three years due to delays in getting required land from the defence ministry and securing all the green approvals. Gadkari has set a tight deadline of May, 2019 for the Rs 270-crore project to make the stretch between Dhaula Kuan and IGI Airport signal-free. Work appears to be progressing faster here despite delays in handing over land from the Subroto Park Complex in that neck of the woods. Demolition of some of the bungalows was necessary for the shifting of the Indraprastha Gas Ltd (IGL) pipeline and only then can the construction of the flyover at Cariappa Marg crossing and the underpass to connect Subroto Park with the residential area across the road be taken up. All this ceaseless construction activity is taking place in and around a one sq km area on two sides of the road leading to the airport complex. What this has done is created consternation and acute disruption to commuters. Both access roads to Delhi are blocked at the same time irrespective of the hour. If there was a primer on how not to construct an infrastructure project then these two are the best examples of how not to go about it. Throw in some rain and you have the makings of an unmitigated disaster. Remember late August 2016 rush hour. US Secretary of State John Kerry was delayed in the traffic crawl along with his convoy after he landed. Journalist Nicolas Wadhams, who was accompanying Mr Kerry on his tour to New Delhi, tweeted: "John Kerry stuck in traffic like everyone else on wet New Delhi night." Another journalist Steve Herman tweeted that the Delhi Police had to be called in after Mr Kerry was stuck for over an hour, additional forces then came to rescue his motorcade. dues under Section 9 of the IBC. Lavasa, owes more than ₹3,000 crore to lenders, owns about 20,000 acres in Maharashtra. A government registered valuer has estimated the land cost at ₹9,280 crore. “Lavasa is a very special urban development project and an initiative well ahead of its time. While shareholders’ interests have been sacrificed, we are hopeful that the pioneering efforts to grow Lavasa into a thriving smart city will now find stewardship in the hands of a new owner, enabled by NCLT,” said Arjun Dhawan, director and group chief executive of HCC in an exchange filing. According to data from the Delhi Traffic Police, around 200,000 vehicles use the stretch during peak traffic hours in the mornings and evenings. In 2009, a 900 m single-carriageway flyover was constructed at RTR junction after the machinations of three high profile residents of Vasant Vihar. However, instead of easing commuter woes, it has only increased bottlenecks on the road, leading PWD to realise that the flyover was not wide enough and a parallel one had to be constructed to ease the traffic flow from both sides. Media reported that another PWD official said the traffic starts bunching up at the foot of the existing flyover while commuters try to manoeuvre on to the elevated road while avoiding construction blockades set up between the Munirka petrol pump and the Army Hospital at Subroto Park on National Highway 8. “Out of 2.7-km length of the flyover, concrete slabs have been laid on 500m stretch measuring 40 spans of the under-construction bridge. It will take at least four to five months from now to complete the construction work. We are hopeful of completing the construction work by the end of March next year,” the official added. Subhash Chand, the head of traffic engineering and safety division at Central Road Research Institute (CRRI), said that the project was already 23 months late, and delaying it further would not only aggravate traffic problems in the area but add to the overall cost.“This project is so crucial to the city. It should be put on the priority list. Instead of a blame game, the government (department) should come forward, integrate all the resources, and make efforts to finish the work,” Chand said. The process of installing girders is now being sped up, as the flyover is already 21 months behind the original deadline. “Now, all 77 portals are complete. The steel girders, too, have been laid on 1km stretch on the 2.7km flyover,” a senior PWD official supervising the project said. Officials claim that the deadline may seem unrealistic but they are not changing it yet. “We will try that the company finishes the work in a timely manner,” an official said. The pillar and surface work had begun from the entry point of the existing RTR flyover, up until pillar 58. Girders were already in place near the T-shaped pillars at the Munirka end, while the work using heavy cranes was going on at the Army hospital end. As the construction continues, traffic crawls below the portals, with delays of 20-30 minutes at peak hours. Dust pollution too has become synonymous with the area. Delhi traffic police even had to halt the traffic movement from Munirka towards the IGI on Saturday morning to facilitate the construction work. PWD officials familiar with the project cite many reasons behind the inordinate delay — from delay in getting nod for tree felling, permission for diversion of traffic, shifting of power lines and DJB utilities, and even the court cases filed by nearby residents. Under the twin RTR project, PWD has to construct an underpass from Benito Juarez Marg to San Martin Marg and Ring Road as well. But traffic police has refused to give a nod to dig a tunnel on Ring Road until work on the RTR flyover is over. PWD has been constructing the approach to the tunnel on the roads. More time consuming work of erecting pillars is finished. The Unified Traffic and Transportation Infrastructure (Planning and Engineering) Centre, the agency entrusted with the responsibility to approve projects related to road and transport infrastructure for Delhi, had approved the PWD’s plan to construct an elevated road between Munirka flyover and Subroto Park in 2014. Ahead of the Commonwealth Games in 2010, the PWD built three flyovers between IIT Gate and NH-8 along the Outer Ring Road to make the stretch signal-free. Ever since it opened in 2009, the RTR flyover in south Delhi has been a nightmare for motorists. While the first two flyovers near IIT Gate and Munirka have dual carriageways, the narrow and single carriageway RTR flyover becomes a bottleneck. There in lies the rub of the flyover. Powerful resident activism for their own welfare sabotaged the construction of the flyover and ensured that only a single carriage way was built. Then, when it dawned on one and all that the architectural marvel was the reason why everyone was sweating, the Delhi High Court asked the Delhi government, “Why did you make a single lane flyover? It always gets choked with traffic. We have spent hours on the road on our way to the airport. We have all been victims.” The court’s observation came while hearing a plea by various associations representing the Vasant Vihar residents, who have opposed PWD’s decision to build a three-lane flyover parallel to the one already there at an estimated cost of Rs 211 crore. Subsequently in October 2014 after passing strictures earlier on PWD and Delhi government, it passed an order — allowing the PWD to go ahead with its project to build a three-lane flyover parallel to the one existing at RTR Marg on the Outer Ring Road here. A judicial bench, however, told the authorities that they should make operational their alternative routes and try to decongest the heavy traffic expected during the construction work there.